Sixth Annual HMB Fall Classic Pre-PLAAY, Dallas, TX! 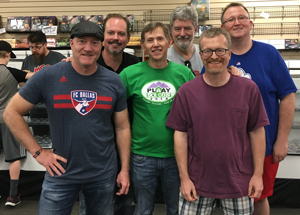 Baseball Fun in Big D: PLAAY Gamers gathered at Madness Games & Comics for the 2018 Fall Classic Pre-PLAAY: (from L) Gary Brown, Albert Taylor, Keith Avallone, Bobby Scott, Joseph Dowell, Wes Wilson. Saturday September 15th, 2018 PLAAY Games returned to the Dallas area (we were based there, 2000-2004) for the Sixth Annual HISTORY MAKER BASEBALL Fall Classic Pre-PLAAY! 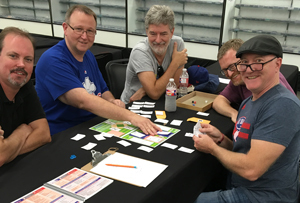 The action went down at Madness Games & Comics in Plano TX, and PLAAY Gamers on-hand included Gary Brown, Joseph Dowell, Bobby Scott, Albert Taylor, Wes Wilson and Roger Belger, along with PLAAY Games' Keith Avallone. Together, we knocked out one of the most exciting Fall Classic Pre-PLAAYs ever! On August 28, we fast-forwarded through the last few weeks of baseball's 2018 regular season with HMB's Universal Instant Results chart to establish our own playoff field. AL division winners were Boston, Cleveland and Houston, with New York and Oakland earning Wild Card berths. NL divsion winners were Atlanta, Chicago and COlorado, with Milwaukee and St. Louis the wild cards. We brought the cards of those four ball clubs (Boston, Cleveland, Colorado, Milwaukee) to Dallas, and moved to a "game seven" format to determine our Fall Classic participants. BoSox Win! Final roll of the ALCS Game Seven, Kimbrel gets Encarnacion to ground out, stranding Alonso and Brantley. NLCS Game Seven, Milwaukee (Guerra) at Colorado (Freeland): Wes Wilson managed Colorado, Gary Brown took Milwaukee. Milwaukee's Jesus Aguilar had a pair of RBI doubles (in the first and seventh innings) and four Brew-Crew pitchers shut down the Rox. Colorado had its chances, but left two runners stranded in both the seventh and eighth innings. Milwaukee 3, Colorado 0. ALCS Game Seven, Cleveland (Kluber) at Boston (Sale): Bobby Scott called shots for the Sox, Joseph Dowell was in charge of the Tribe. Boston's Sale kept Cleveland off the base paths, scattering two hits over seven innings with eight strikeouts. Cleveland rallied late against relievers Boston Brasier and Kimbrel, getting two men on with two out in the bottom of the ninth. But Encarnacion grounded out to send the Beantowners to the Fall Classic. Boston 3, Cleveland 0. Game ONE at Boston: (Rodriguez vs. Chacin) Milwaukee struck first, grabbing a 3-0 second inning lead on Arcia's three-run homer, but Rodriguez settled down and Boston got home runs from Moreland (who scored three runs this game) and Martinez to pull ahead. Boston 7, Milwaukee 3. Game TWO at Boston: (Sale vs Suter) Sale was pitching on short rest and it showed, he was rocked early and yanked in the third inning with Milwaukee up 8-2. The BoSox managed to get two back in the fourth, but it was no where near enough to stem the Brew Crew dinger-fest: Milwaukee belted seven home runs in all, three from Travis Shaw (who had 8 RBI for the game), and two from Eric Thames, as the visitors tied the series at 1-1. Milwaukee 14, Boston 5. Game THREE at Milwaukee: (Miley vs. Price) Milwaukee got home runs from Kratz and Thames (his third of the series), and the bullpen came through in a couple of tense situations—Boston left the bases loaded in both the eighth and ninth innings, getting zero runs. Milwaukee 5, Bostin 3. Game FOUR at Milwaukee: (Chacin vs. Rodriguez) Boston scores five runs in seventh inning to take an 8-3 lead, Kinsler with a three-run HR. Milwaukee got a pair of runs in both the seventh and eighth innings, but its late rally fell juuuuuust short, and Boston tied the series 2-2! Boston 8, Milwaukee 7. Sending it to Game Seven: Boston's tense win in game six meant we were going the distance for this series! All smiles—what a great series it was! Game FIVE, at Milwaukee: (Suter vs. Sale) Milwaukee's Shaw blasts two MORE solo homers to erase an early 2-0 Boston lead. Suter puts in six strong innings, Milwaukee bullpen nails it down to put the Brew Crew a game away from winning it all as the series returns to Boston! Milwaukee 4, Boston 2. 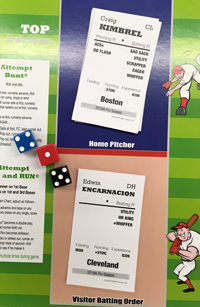 Game SIX at Boston: (Miley vs. Porcello) Boston chased Miley in third inning, pummeling him for four hits and drawing a pair of walks, grabbing a 5-1 lead. Milwaukee's bullpen was air-tight (as usual) from there, and the visitors got back in it. Arcia lofted a run-scoring double in the fourth and Aguilar's single knocked in two in the fifth to make it a one-run game. Milwaukee got two on with no out in the seventh, but Cain grounded into a double-play and Yelich popped out to end that threat. In the ninth inning, Moustakas reached first on an error by Bogaerts, but another double-play(Schoop) ended that threat and sent the series to seven games. Boston 5, Milwaukee 4. Game SEVEN at Boston: (Chacin vs. Sale) With the series on the line, we decided that Sale should be on the mound for the home team, again on (really) short rest. We made Sale 2/2 for freshness, which we all agreed was reasonable. Milwaukee threatened early, loading the bases with one out in the first inning, and it looked like a repeat of game TWO for Sale. But Pina hit into a double-play, a real killer. Boston then jumped all over Chacin, Devers with a first-inning bases loaded triple. Benitendi's two-run homer on the second inning made it 5-0. Sale was lifted in the fifth inning after giving up a lead off triple to Arcia, and the BoSox bullpen took it from there. Boston 8, Milwaukee 1. A huge thank you to everyone who attended, and special thanks to Chris Hoberg and his crew at Madness Games and Comics. They really made us feel welcomed and at home. As they say, "Everything's bigger in Texas," and Madness G&C certainly qualifies! Located in the heart of Plano, Madness Games & Comics is an honest-to-goodness "Mega Store"—on the scale of Home Depot or Sam's Club! In addition to an incredible selection of games, collectibles, comic books and pop culture goodies, and their gaming area is the biggest I’ve ever seen! Not to be missed if you're in the area and love games!